One of the critical assumptions of the Cox proportional hazard model is the proportional hazard (PH) assumption. That is, the hazard ratio across time is a fixed value. where is the baseline hazard at time t, is the hazard for individual i, and x is the set of covariates. Looks like all the time-variant covariates fail this test in this model. Box-Steffensmeier and Jones recommend adding interactions with those variables that vary by time. In this case, I’ve constructed a new variable to approximate the number of competitors left in the competition, CompLeft. I say “approximate” because it would decline monotonically if it wasn’t for edge cases, like this season’s double elimination and cases in which Ru lets both queens stay. I’ll touch on this later below. observations within a cluster, the Wald and robust score tests do not). Looks good on that front. One thing that I’ve been puzzling over is that, given that we know the baseline hazard, we could directly put it in the model. This is the intuition behind the CompLeft variable. Since I’ve already incorporated this into the first model, let’s see how it fairs with the second model. CompLeft           0.15362   1.16604  0.09737   0.08953  1.716   0.0862 . So attempting to estimate the baseline hazard directly, there’s a slightly statistically significant effect. I read this as a small increase in the risk of elimination for each additional competitor that is left. I promised last week that I was going to do some cross-validation. Particularly I was thinking of doing something like a Leave-One-Out Cross Validation (LOOCV) where the “one” would be a season for each of the four completed seasons. When it came time to do this, though, I mostly puzzled in how I would assess the adequacy of my model. Given that this is a survival model, would I say the model is good if it is able to predict the next queen who is eliminated before each episode? Would I say it is good if it predicted the correct order of placement? I’m at somewhat of an impasse, here. It seems like I need a test that uses the most information to assess goodness-of-fit. I’d appreciate comments on this. 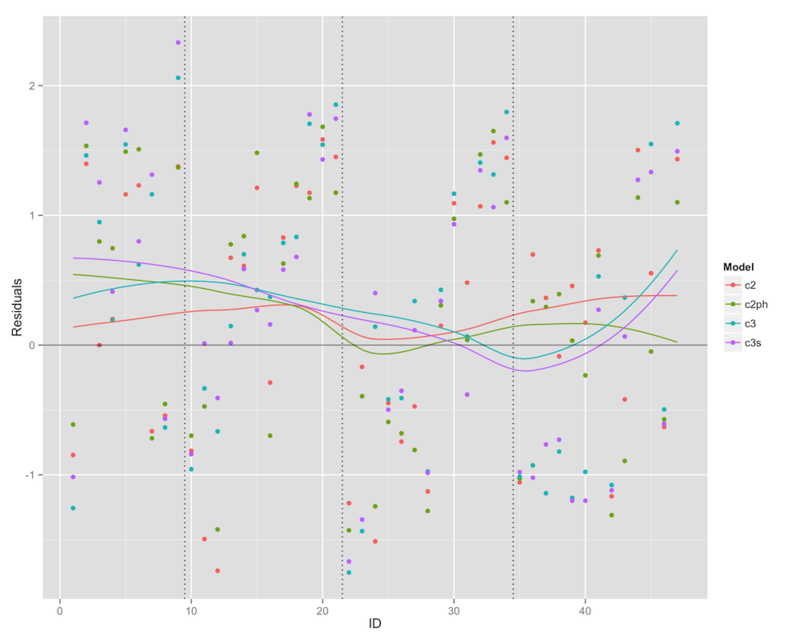 Until then, I decided to look at deviance residuals across queens from the past four seasons to judge model fit. c2 is the original model, c2ph is the model with interacted terms to account for the PH assumption, c3 is the second model, and c3s is the second model with the CompLeft variable included. The vertical dotted lines denote separation between seasons. It looks like, in general, the model is above zero, which means it underestimates the probability of elimination. Curiously, the c3 models seem to really underestimate failure in season 4. Let’s look at the mean squared residuals. There doesn’t seem to be much movement here — small decreases in the c2ph and c3s models. Not terribly surprising. So who’s going to sashay away? Enough of all that. Let’s run the numbers for this week, using the latter two models. Using c2ph, Jinkx-y comes out on top, while Alyssa is in imminent danger of elimination. In model c3s, we see a somewhat different story. Roxxxy takes lead honors, but Detox is on bottom. However, the relative risks here are rather close to each other, compared to the previous model. One of these days, I’m going to get a prediction right. Is it this week? We’ll find out soon enough… Until next time, squirrel friends. P.S. All new code for this week can be found in this gist. It should be used in conjunction with the code from the original one, which has been slightly edited to fix some data errors. Posted in Event history analysis, R.Tagged drag race, prediction. Insert bad pun about someone’s proportions being hazardous? I love that you’re one of my colleagues. Amazing. Thanks! Are you in sociology or in Madison? Or both?